Alright y’all Craft Lightning has come to a close but I will be back this weekend to wrap everything up for you. I interrupt briefly to give you an update on our teen room. We are continuing progress and hopefully will be ready for a reveal soon. Today I thought I would show off my painted chair and show you where to find some painting tips and tricks for your next paint job. PPG Architectural Finishes who manufacture Glidden paints approached me about watching some videos that my friend Lindsay with Makely Home stars in with painting tips and tricks. Um…yea! I heart seeing bloggers in videos. So lets check out that painted chair and watch a video today! No transformation post is complete without a before and after y’all. So here it is! I actually bought that chair years ago at a yard sale I think? Anyway I had put that neon striped fabric on it then. 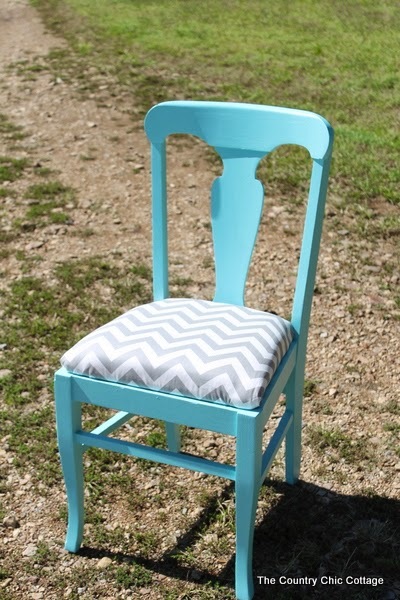 I removed that fabric, gave that chair a fab paint makeover, and recovered the seat in chevron. Boy it looks better! 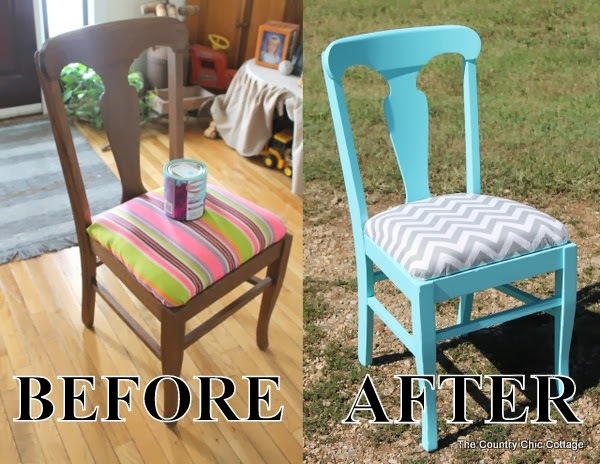 The paint color I chose for the chair is one of the colors used in my DIY gradient color wall. I did not talk much in that post about how to choose color for your room. Luckily Lindsay had a great video for me when I was picking paint colors in my room. You can see all of Lindsay’s videos by the way on the Glidden You Tube channel. Here is the short 30 second video on choosing a paint color for ya. We choose a gray for the majority of the room but the focus wall is the gradient wall with various shades of aqua. I grabbed the middle shade for this chair. 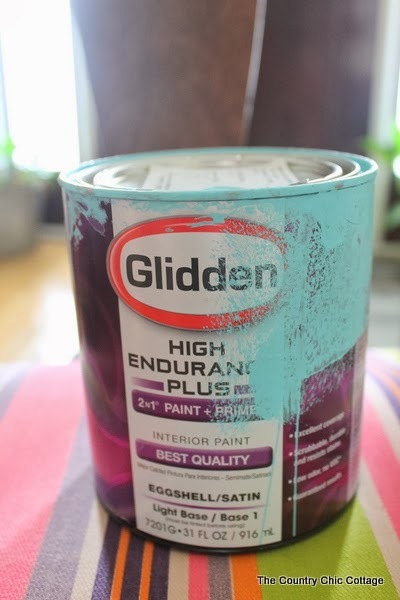 My paints were all purchased at Walmart which carries the Glidden High Endurance Plus Paint and Primer in one. Definitely my pick for an awesome paint job. 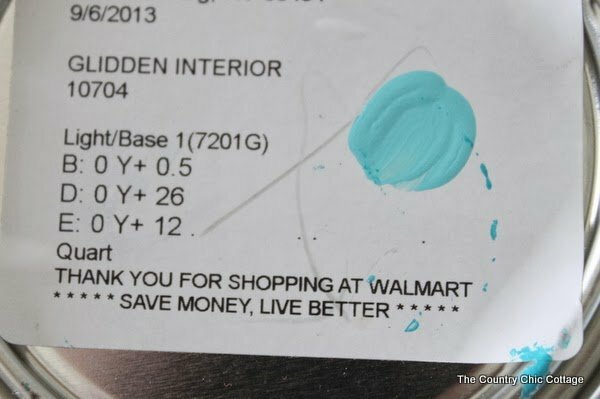 Just in case y’all need the details on that color (I had them match off of a competitor’s paint chip) here is the formula you can give to your paint counter. If you are looking for more than just videos in your color hunt, PPG also runs the My Colortopia website where you can get advice, upload pictures of your room, and in general see your favorite bloggers and their painting tips. Now back to that chair y’all. It took me just two coats to get rid of that ugly brown. The seat covering is a whole other story but I did it! 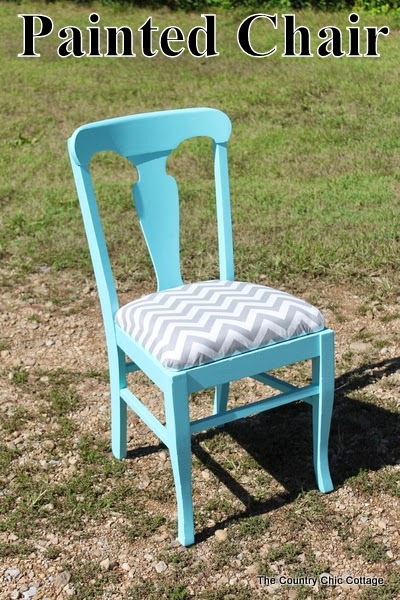 A perfect chair for a teen room don’t you think? Stay tuned over the next few weeks as I finish up the projects and reveal the completed room…you don’t want to miss this. What painting projects are you working on? Watch Lindsay’s videos before you begin to get it right the FIRST time. next post: Quick Halloween Crafts — over 40 ideas under 15 minutes! What a difference a few changes can make Angie! I love LOVE your finished product! I have been on a grey kick lately too and that aqua is a great complimentary color, love it! Loving the color combo! And great tips in the video. 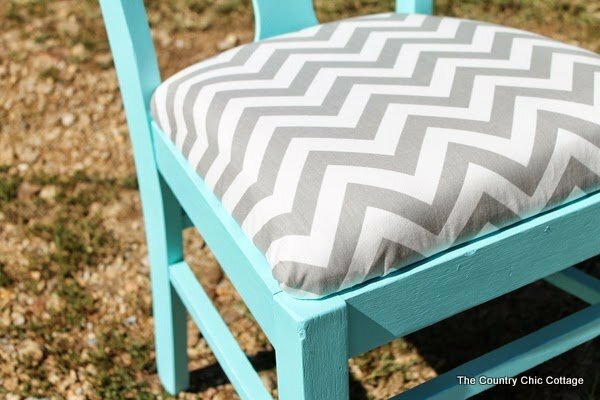 The grey chevron looks perfect with that paint color! Very fun, Angie! What a difference! I love those colors together!